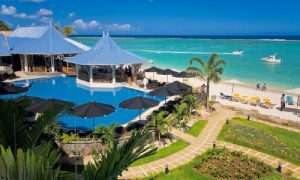 Hotel Description: The warm and sunny west coast of Mauritius is famous for its sandy beaches, warm and stable climate with 350 days sunshine all year round and last but not least scenic and colourful sunsets. 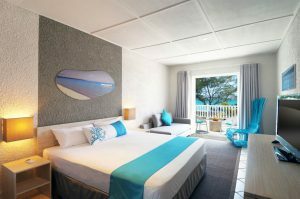 Right there, at the beginning of Wolmar by the long and white sandy public beach, the recently rebuilt Pearle Beach Resort Hotel exudes a tasteful and modern ambiance. Its whitewashed main building with the blue roof stretches along the beach and thus most of its 64 rooms offer pool and Ocean views. The Standard rooms are furnished in a light and airy style, kept in soft shades, and tastefully decorated with artwork; featuring twin or double queen-sized beds, daybed, flat screen TV with satellite channels, mini bar, tea- and coffee maker, safe, shower and toilet, hairdryer, individual air conditioning and direct dial telephone. The very modern bathrooms are separated by charming wooden shutters, thus providing a rustic yet refined atmosphere. All rooms offer ample space for 2 adults. Baby cots can be put into the rooms upon request; the sofa bed sleeps one additional guest. Guests may relax around the pool and on the beach terrace under the tropical umbrellas. A wide range of sports activities, some free and some for an additional fee compliment the range of massages and treatments offered in the Spa Kiosk, a pavilion which has been set up by the beach until the finishing touches have been laid onto the actual spa building. 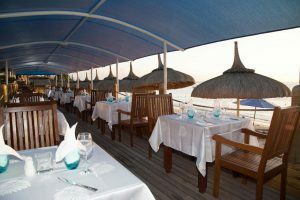 Buffet breakfasts, a la carte lunches, table d’hôte, grills and buffet dinners as well as a great view over the Ocean can be enjoyed in the main restaurant Blues”. 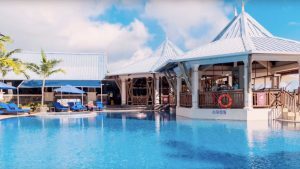 For those in for little island delights, the bar by the pool deck offers snacks and grills as well as pancakes and refreshments. You may just simply enjoy a fresh breeze floating in from the Ocean while comfortably relaxing in your beach chair, listening to some hot music and enjoying a cool drink while taking in the scenery. For those wishing to combine their beach vacation with a family gathering or business event, the conference room hosts banquets, business meetings or large groups and is equipped accordingly. You and your loved one will be left with nothing but exquisite feelings of passion and love for a lifetime. Share the journey of love as you take pleasure in a discounted tailor-made package. You can look forward to exciting holidays at Pearle Beach! Dive into the magnificent 325m2 swimming pool or into the lagoon, not far away, and choose from our plethora of land and water activities. For honeymooner-Special Fruit Platter , Sparkling wine , Pareo and Tshirt as Gift in room upon arrival, Special Candle Lit dinner on the beach for the Honeymoon couple,25% Discount on Spa Treatment . Hotel features 76 rooms, all designed to meet the growing demands of our clientele, closely attuned to exoticism and well-being. A world-class interior design, bathed in colours that complement the surrounding landscape, and equipped with all the necessary equipment and amenities, makes for an enhanced experience. Immerse yourself in bustling and multifaceted atmospheres with our evening entertainment, generally inspired by the dinner theme. Enjoy a carefully crafted and entertaining show two to three times a week. On Saturdays, Pearle Beach invites you on a journey to the origins, with a “Sega” show. Songs, music and dance, deeply rooted in local folklore, thrill an audience carried away by the rhythm of the ravanne, maravanne and the triangle… Feel the beat of Mauritius as these notes resonate with distinct African accents. Windsurfing, pedalo, kayaking, snorkelling, paddling.